The Innovation Radar is an initiative supported by the European Commission focussing on the identification of high potential innovations and the key innovators behind them in FP7, CIP and Horizon 2020 projects. Using the radar, the best EU-funded innovators have been identified to compete with their EU-funded innovation for the annual Innovation Radar Prize. Connect people such as startups, investors, accelerators, corporate networks, and universities through our array of networks. Help startups soft-land in other markets such as Silicon Valley (SEC2SV), or India (Startup Europe India Summit). Celebrate entrepreneurs’ success: Techallstars, Europioneeers and StartUp Europe Awards. 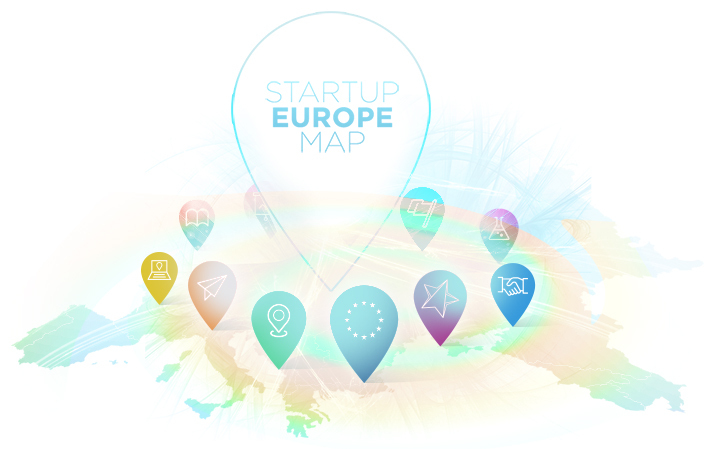 Startup Europe Map is an initiative with two objectivs. Firstly, help startups and corporates to establish contacts, share experiences and retrieve funding among other European key players. And secondly, reduce the lack of knowledge of the support activities and services available to the entrepreneurial ecosystems. Tha map also aims to identify everyone who plays a part in the building of the startup ecosystem. By having a space on the map, it’ll be easier for relevant stakeholders to identify accelerators, incubators, investors, corporations, universities and public administrations involved in their environment. Brother project IRSUS will bridge the gaps faced by innovators (research teams, SMEs, spinoffs & start-ups) to reach the market with a feasible, viable and attractive business case and strategy for users, clients, partners and investors. IRSUS will support researchers and innovators through the road to market. Close to 200 promising ICT innovations detected by the Innovation Radar methodology by the European Commission will directly benefit from IRSUS support, to successfully drive their way to markets and to reach commercial exploitation. ScaleEUP2 main area of focus are deep tech and IoT startups, especially those embrancing the verticals of Mobility, Smart Cities, Industry 4.0, Health and Well-Being. The objectives of the project are to foster collaborations, attract private and public finance, facilitate market access and map all startup potential. Softlanding project organises 40 1-week missions for 200 key representatives to startup destinations: Lithuania, The Netherlands, France, Germany, US, India, and more. 40 events in the 4 European ecosystems will give a stage for sharing best practices and lessons learnt, and transferring knowledge on scaling up. MY-GATEWAY services are designed for startups, scaleups and other ecosystem builders such as investors, accelerators, universities, students and public organisations from the Czech Republic, Romania and Slovenia. The main aim of the project will be to organize four Scaleup Summits to facilitate startup-corporate partnerships, increase international visibility for European scaleups, and foster exit opportunities (IPOs in particular) in four ecosystems: Italy, Belgium, UK, and Spain. Help startups to scale by leveraging the access to European markets offered by four major startup hubs (Germany, France, Spain, Estonia). More specifically, the project wants to create a close-knit support system to help startups streamline their market entry in other EU countries to push the one-stop-shop approach which was proved the most needed across all the ecosystems. The project will stimulate European investments in digital sectors and create increased mutual understanding between investor communities and in particular ICT startups and scale ups. The consortium is composed by established Business Angel networks in the Nordic region, mainly in Estonia, Norway, Finland and Denmark.